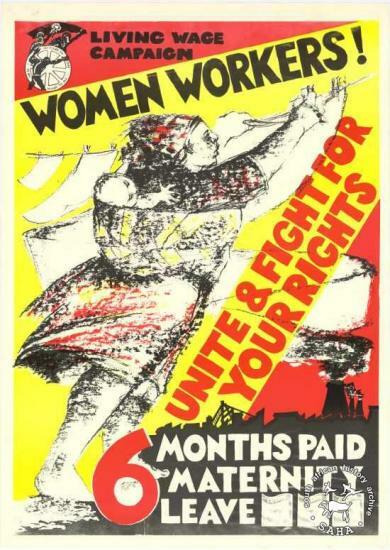 Description: This poster is an offset litho in black, red and yellow, produced by the Gardens Media Group/ CAP for COSATU, Johannesburg.This poster refers to COSATU recognising the need to pay special attention to the organising of women workers. The text reads: "LIVING WAGE CAMPAIGN : WOMEN WORKERS! 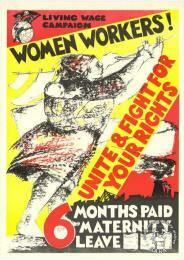 : UNITE & FIGHT FOR YOUR RIGHTS : 6 MONTHS PAID MATERNITY LEAVE". Digitised by Specialised Archival Solutions in 2009. Reproduced in "Images of Defiance: South African Resistance posters in the 1980s" on page 61 (number 103) of the 1991 SAHA / Ravan Press edition and the 2004 SAHA / STE Publishers edition. It is also included in the SAHA Exhibition Kit - Women and the SAHA virtual exhibition - 'Hlanganani Basebenzi: Commemorating South Africa's Labour Movement'.